Right on the beach, snuggled into the foot of the bluff, the Original Beach House was built in the 1940s and was level with the beach. Now the beach is about 10 steps down from the patio. Great sunsets, quiet mornings and beautiful lake and sky views from every room. Everything you need for a beach vacation - beach chairs, umbrellas, beach towels. Please note: This is a beach house. It is not a fancy condo with granite countertops and a huge TV with 500 stations. The bottom was built sometime in the 1940's. The second floor was added around 1954. It is updated and very clean with everything you should need for the beach. You will always be tracking in sand. There are animals on the beach - especially deer. You have 200 feet of private beach with no other houses but the neighbors will be down on their private beaches and you might have them down at night with a beach fire and fireworks. The public is allowed to walk along the water's edge so you will have a few people and their dogs walking by. There are 76 steep steps you have to go down to get to the house on the beach. There is a wall air conditioning unit in the second floor. On hot summer days, close the windows and blinds and it will cool down (but not be cold) until the sunsets and the entire beach area cools off. Just be aware, this is not a fancy fancy new house with fancy kitchen and bathrooms. It is a beach house. A traditional beach house. Actually on the beach, snuggled at the bottom of a wooded bluff, just a dozen steps off the patio and you are on 200 feet of private beach. No other cottages on the beach. Beautiful sunsets. Wonderful quiet mornings with coffee on the beach or patio. 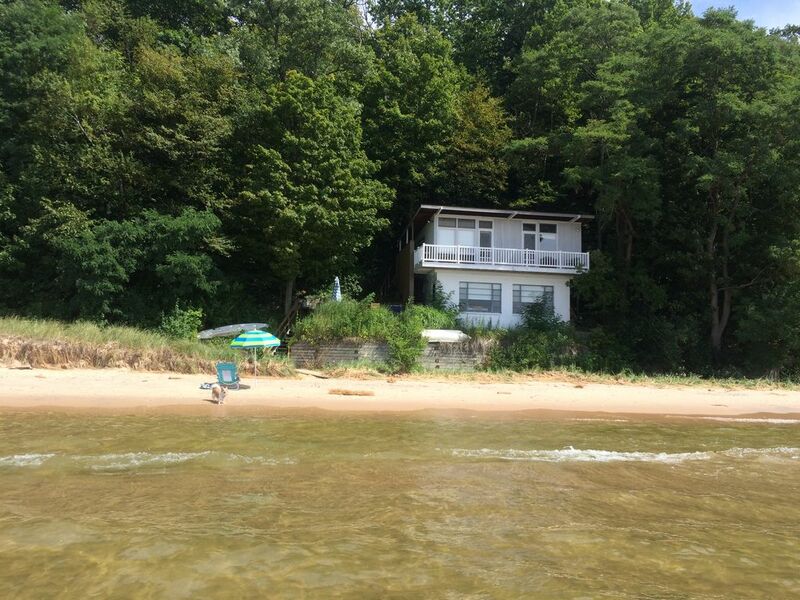 Located in the resort town of Douglas, across the river from Saugatuck (known for art, boating, shopping and terrific restaurants) this the definition of beach house. Watch the fantastic sunsets from the patio or have a bonfire on the beach. The beach is all 'white sugar' sand with no rocks. The Beach House is surronded on 3 sides by mature trees, the 4th side is beach and Lake Michigan views! You are only 5 minutes away from the activities of Saugatuck and Douglas yet have complete privacy. The living room, furnished with white wicker furniture includes a dining area and kitchen with windows all the way across. The first floor has a convenient half bath. The kitchen is small but fully equipped with small stove and oven, toaster oven, coffee maker, pots and pans, paper towels, new fridge. The table seats 4-6. Second floor has two bedrooms and a full bath (shower,no tub) Master: queen-size bed 4 poster bed with orthopedic mattress and 100% cotton sheets. Full window and glass door overlook lake. A new flat screen TV with built in DVD player. The other bedroom has two twin trundle beds and windows all across. There is a moveable wall between the two trundle beds for privacy. Second floor has a wall air conditioner - will keep it cool but not frigid. All linens - sheets and towels, blankets, comforters, etc provided. Patio: has a big smoker/grill that takes charcoal. Round table with umbrella seats 4 comfortably and you can squeeze in 6. Beach: all sand, no rocks. Two Adirondack chairs provided sand chairs, beach umbrellasand beach towels provided. Bonfires are to the south of the beach away from the sun bathing area. We ask that when the fire department issues no burn warnings that they be honored. We also ask that you burn only paper and wood - no bottles, metal, cans, or garbage. The Beach House is not suitable if you have very small children that have to be carried up and down stairs. Smoking is not allowed in the building. It is a casual, secluded home. It is clean, up to date and fun to stay at. It is a traditional beach house, not a granite countertop, all white walls and modern furniture condo type of place. You will always track sand in! Other considerations: Spotty cell phone coverage. No cable TV. No wi-fi. No washer and dryer (there is a laundrymat just down the street.) No dishwasher. Every year I try to get cable TV and internet service. The house is in a very unusual location and the cable company cannot provide service! Please note because of its private setting, there are over 70 steps from the road level down to the beach house. Again, this is a traditional beach house - not a condo. You get the beach, privacy, the best views around in a clean, up-to-date place that is ready to move into except for the groceries. It is a dream vacation for someone wanting the beach and privacy with the restaurants, shopping and activities of Saugatuck Douglas just 5 minutes away. The first floor was built sometime in the 1940s. The second floor was added in 1954. Clean, up-to-date but not fancy. It is a beach house and you'll always track in some sand. If you like the beach and privacy, this is the place. No other houses around, right on the beach. Be sure you consider the steps though. Everyone should be ok with using the steps. When you are at the beach house you have quiet and privacy since there are no other houses nearby. All the activities of Saugatuck are just 2 miles away. You have the resorty shopping-eating-art experience along with your quiet, private beach time. Upstairs bathroom is the full bathroom with a shower, toilet and sink. Downstairs is a half bath with toilet and sink. You are 1 mile from Douglas and 2 miles from Saugatuck - both resort towns. You can see the beach and water from every room. On 200' of private, sandy beach. The house is on the beach down the bluff. Parking is on Lakeshore Drive. and you must walk down 76 steep steps to get to the house. Look at stairs photos. Second floor has an in-wall unit. Will cool and take out humidity but will not make it chilly. House has heat if you need it. Control on first floor. Beds will be freshly made when you arrive. Plenty of towels. Beach towels too. Yes - a drip coffee maker and plenty of filters. and a Keuring with K Cups. Drip and Keurig coffee with K Cups - salt, pepper , olive oil - if you need something, let me know. You can arrange to have groceries delivered before your arrival. Yes - plenty of dishes. Refrigerator, electric stove with 4 burners and oven, sink, microwave, toaster, blender, pots, pans, kitchen linens, paper towels. CLEAN. No dishwasher. Table usually set up for 4. Has an extension to pull out for 6. Flat screen with built in DVD player. No TV reception. Plan on using the DVD player or internet. Can't get either cable or satellite because of the location. If you want books, let me know. Some games - if you want something, let me know. If you want toys, let me know what you want. Great sunsets from the balcony. No more than 2 adults at a time please. Patio has table with umbrella, 6 chairs. You must look at the photos of the 76 steep stairs. This isn't a place for anyone with mobility concerns. Patio furniture, Beach chairs, beach towels, beach umbrellas, chairs on 200 feet of private beach. Air conditioning, second floor only. Art Galleries, artisan wine, craft beer, cider, fruit orchards, great farmer's markets, live theater, restaurants.